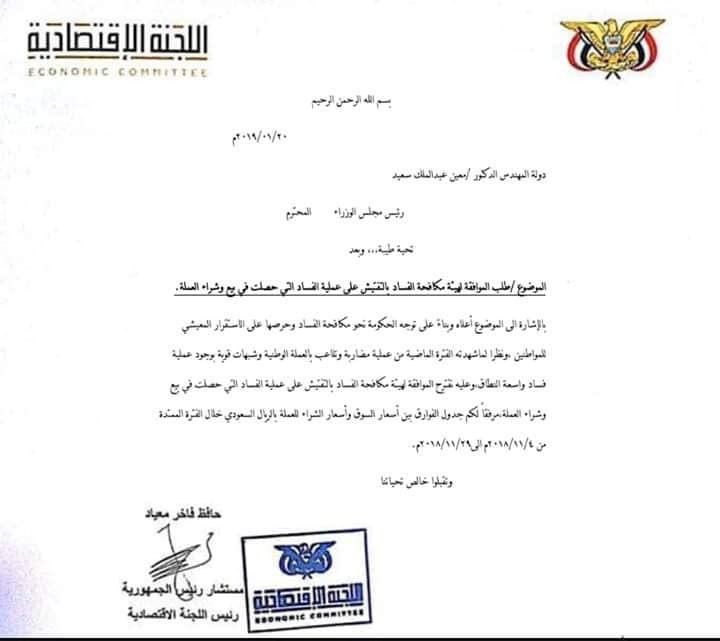 The Central Bank of Yemen (CBY) is trying to assert its integrity and doesn`t involve any of its leaders in any manipulation of the exchange rate of the Yemeni riyal against other currencies, especially After the head of the Intergovernmental Economic Committee, Hafez Fakhir Meayad, revealed last Sunday a corruption operation using the exchange rate of about 9 billion riyals. The board of directors of the Central Bank of Yemen said in a statement published last night by Aden-based "Saba" News Agency, It will take its actions and powers in accordance with the law, in order to reach one of the most important objectives of the bank is to achieve some kind of economic stability. The Central Bank affirmed its keenness to achieve price stability through the financing of basic commodities and its interventions in exchange markets. He claimed that what he called the "successes" achieved during the last year, and began to reap the benefits of the fourth quarter of the same year, came through the stability of exchange rates at acceptable numbers in the current conditions experienced by the country. According to the statement, the Chairman and members of the Board of Directors of the Central Bank, surprised by the publication of incorrect news and information on the use of the bank one of its instruments in monetary policy through intervention in the markets to stabilize prices. The Central Bank claimed that its interventions stabilized the exchange rate of the Yemeni riyal at the limit of 525 and 500 riyals to the US dollar and 135 to 140 Yemeni riyals to the Saudi riyals after reaching large numbers. The statement issued by the Central Bank of Yemen, after the disclosure of the head of the Supreme Economic Committee Hafez Fakhir Meayad, with documents, on Sunday evening, the systematic corruption practiced by the leadership of the Central Bank speculation in the currency exchange market amounted to about 9 billion Yemeni riyals in one month only. Meayad 's revelations stirred controversy over social networking platforms, which activists saw as a "major scandal" in the widespread corruption of the Yemen`s internationally recognized government. The head of the Economic Commission in an official Memorandum posted on the page "Facebook" seen by "Debriefer" News Agency, calls on Prime Minister Dr. Maeen Abdulmalik to direct the General Authority against Corruption, to investigate corruption in billions long sale and purchase of currencies in the Central Bank of Yemen. The Memorandum by the Chairman of the Economic Committee that the past period has been a process of manipulation and speculation in currency, and there is strong suspicion of the existence of a widespread corruption. The memo did not mention the people involved in the corruption, but identical financial sources said that central bank governor Mohammed Zimam and other officials were involved in the currency speculation and made huge profits at the expense of Yemen's already deteriorating economy due to the war. The conflict escalated after a Saudi-led coalition intervened militarily in the country in March 2015 to reinstate the Yemeni government of President Hadi. The conflict has left nearly 16,000 people dead in Yemen, already the Arab world's poorest country, and more than 22 million people in Yemen are in need of aid 8.4 million of whom are on the brink of starvation. Yemen is facing the world's worst humanitarian crisis, according to the UN, with more than two thirds of the 28-million population in need for a type of humanitarian aid and immediate protection, including 8.4 million people unsure how to get next meal, and some 2 million children suffering severe shortage of nutrition.